Decorating our preschool for Christmas is now underway! 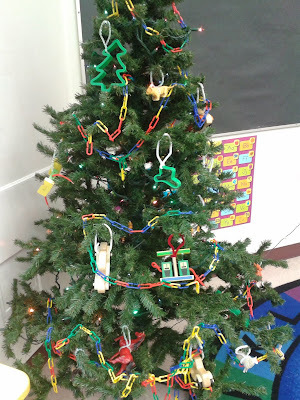 This week the children had fun decorating our tree with toys and making a plastic chain link garland. Our tree may not make the front page of Better Homes and Gardens, but the kids like it. And it's a work in progress. 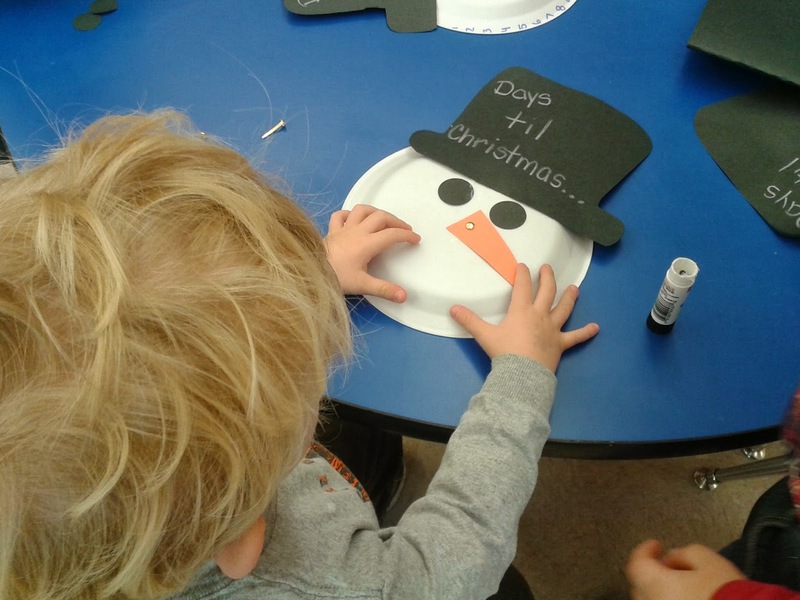 Each of our classes will be adding their own personal touch. Foam ABC letters coming up next! 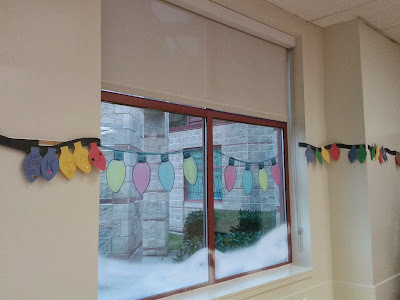 We also decorated our classroom with the children's names "in lights." sequins and glitter, and attached them to a paper wire. 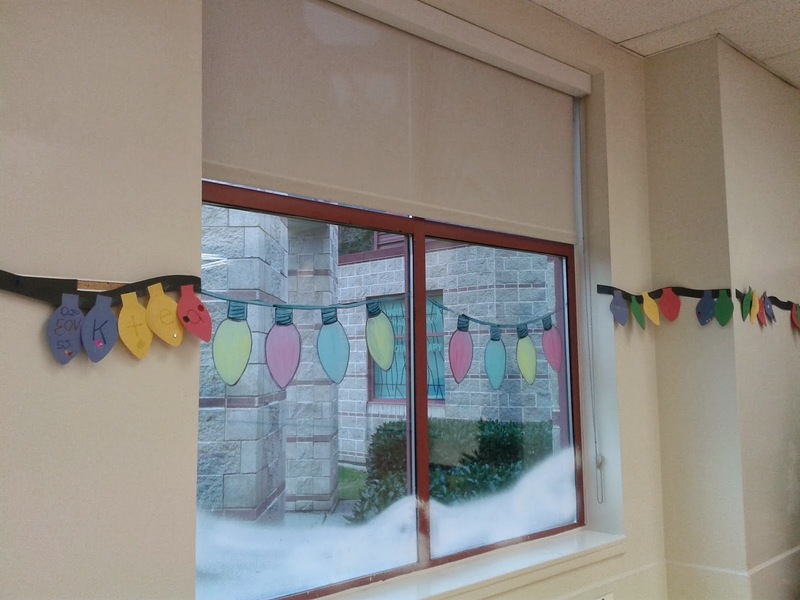 We hung them around the room in line with the Christmas lightbulbs that we painted onto all of our windows. Here's a close up of the painted bulbs. I'm starting to learn a few things about window painting which has improved my results compared to previous attempts. Painting on windows is not like painting on a canvas I've learned! One great strategy I picked up was to draw the images onto the window using a thick black Sharpie. If you decide to do this, don't worry. I tested it and it wipes off fairly easy with a bit of water. I also learned the value of a tracer when you are repeating images. Fairly obvious, but for some reason I didn't think of this last year and all of my lightbulbs ended up being different sizes! 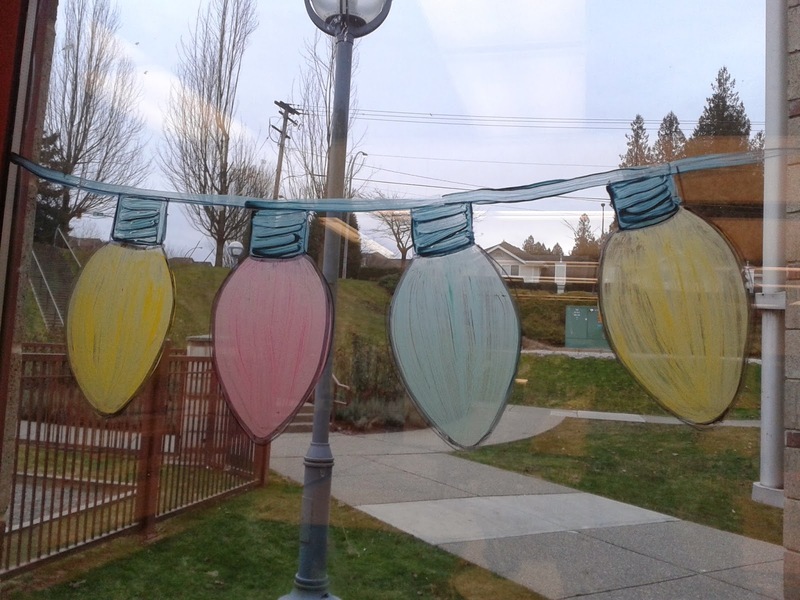 Once all the bulbs had been outlined, I just painted in the shapes with children's watercolour paint. For those of you who want to take your window painting to the next level, the other tip I picked up was to outline the images with white paint at the end. I may try that someday, but not today. It would look awesome, but outlining 50 light bulbs would be quite a commitment! 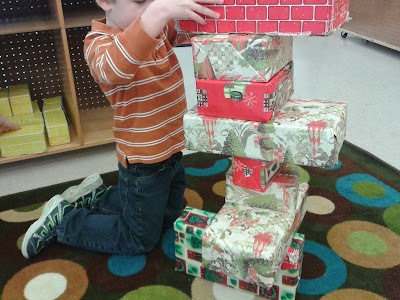 Our blocks are now festively wrapped in paper for the season. 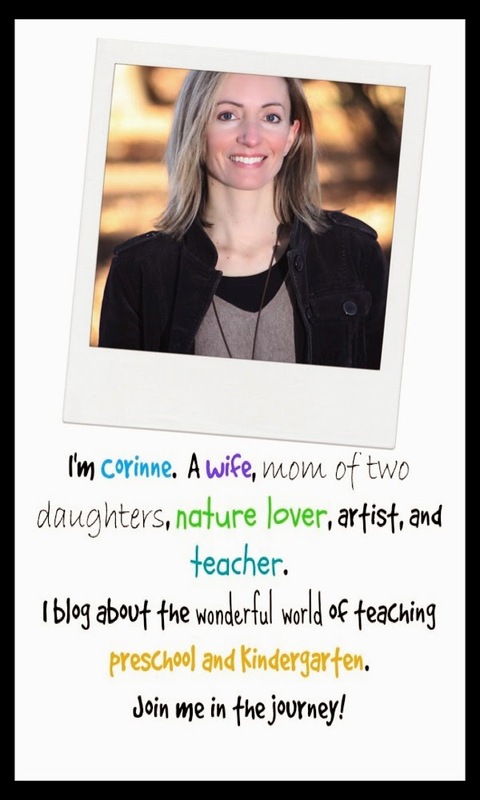 Just make sure you watch the children like hawks on the first day! Opening these "presents" was extremely tempting for some! We set up a winter scene in our sensory bin. 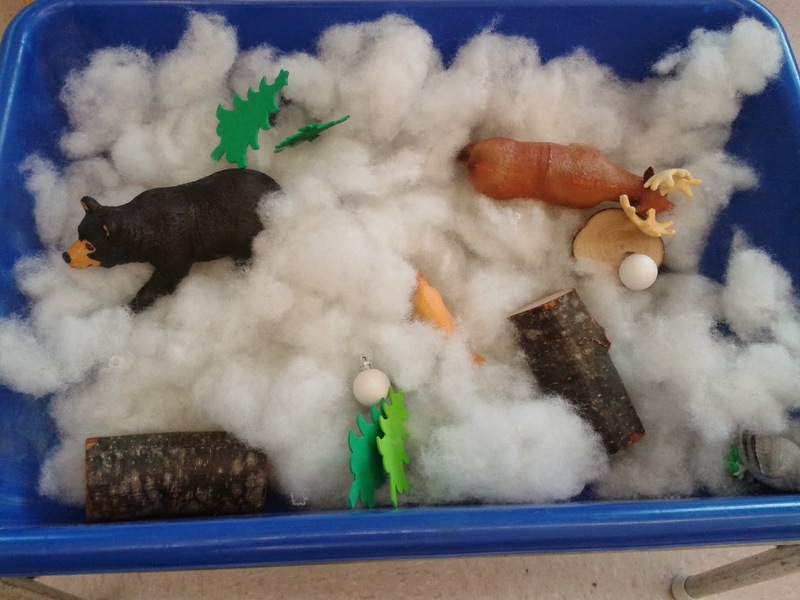 This bin includes cotton "snow," pieces of logs, snowball ornaments, sparkly trees, and a variety of forest animals. And here we are starting a Days 'til Christmas art project. Here is a close up of the Christmas Snowman Counter. 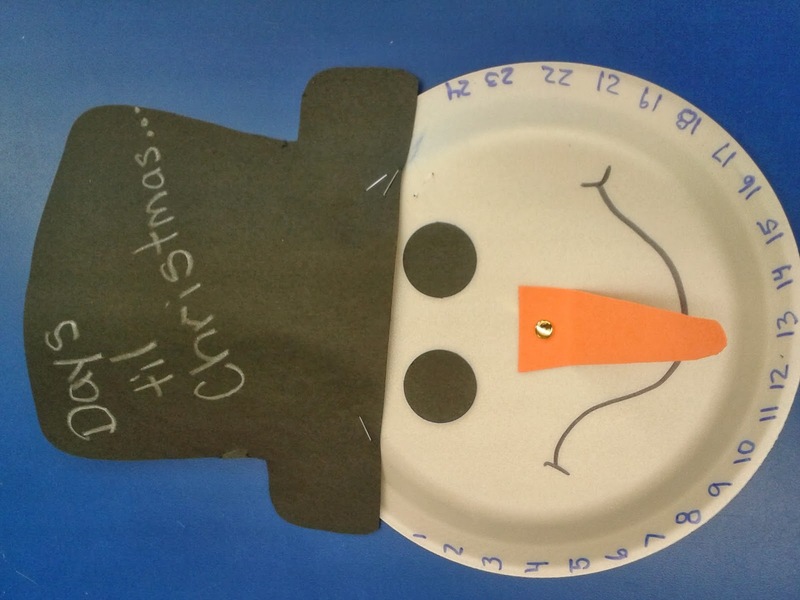 My co-teacher saw it on Pinterest (I'm so sorry but I don't know the link!) and we thought it was too cute! Sorry for the side view! Ah, looks like the nose needs a little adjustment. I think there are now about 19 days left!